20 years ago, Kazakhstan switched its capital from historic Almaty to the modest northern town of Astana. Since then, something strange has grown up out of the steppe. Samuel Goff reports on a city caught between a forgotten past and an uncertain future. At the end of 1997, the Supreme Council of Kazakhstan ratified President Nursultan Nazarbayev’s recommendation to transfer the capital of the country from Almaty to Akmola, a smaller settlement on the northern steppe that took on the name Astana – “capital” in Kazakh. This represented a 1,000-odd kilometre shift from south to north: from the foothills of the looming Trans-Ili Alatau mountains to the dry plains of the central Kazakh desert; from a population of a million to one of a few hundred thousand; from established cultural pre-eminence to artistic tabula rasa. 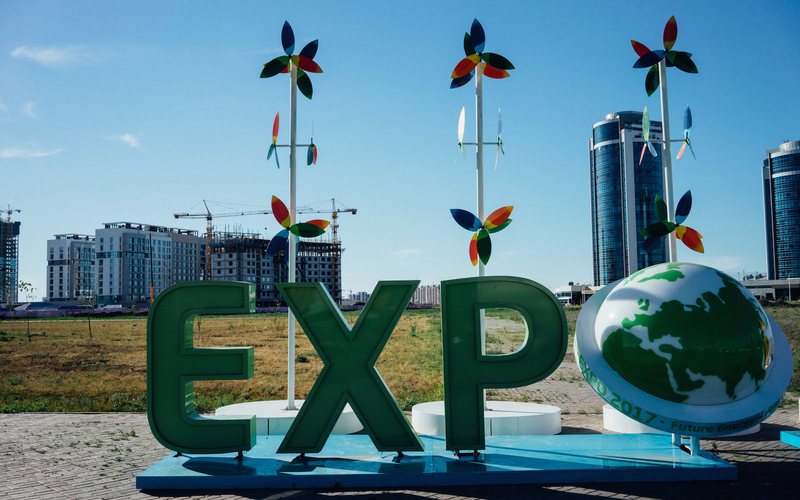 It’s not possible to talk about Astana without talking about Nazarbayev, and one shouldn’t try; the city makes little sense as it is and even less without an account of the elbasy (“Leader of the Nation”, his official title since 2010). Having led the Kazakh government since 1989, there’s precious little he’s left untouched by now. It’s also true, however, that the personal biographies of rulers only ever reveal a fraction of what it means to live or travel in a given place. 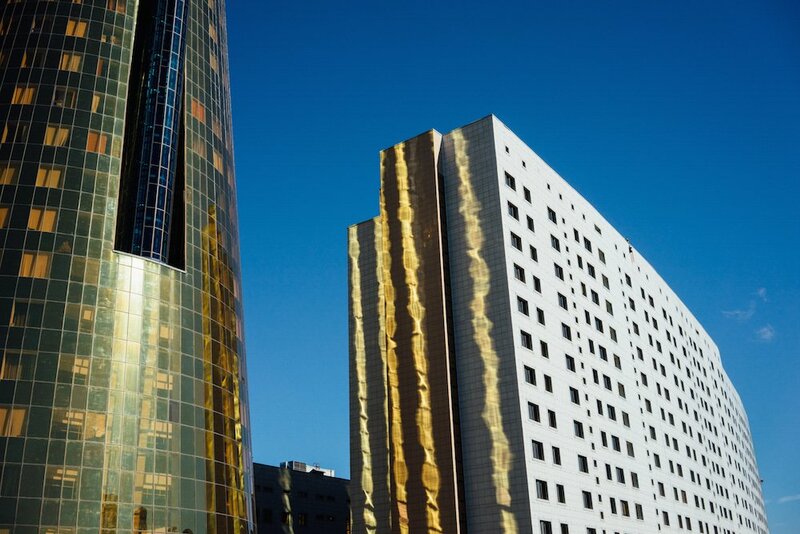 Thanks to Nazarbayev, Astana has in next to no time become a postmodern pastiche, a glass-and-steel protrusion, “the Dubai of Central Asia”, “the space station in the steppes”. Designed to a master plan by late Japanese architect Kisho Kurokawa, it is a playground for the globe-trotting likes of Norman Foster and Manfredi Nicoletti, thrown up on an absurd scale, entertaining but exasperating. It has also started playing host to international jamborees such as the “Future Energy” Expo 2017, which I was in town to attend. Alternatively roasted by summer sun, blasted by steppe winds and brutalised by long winters, this often feels like a thoroughly inhuman city. 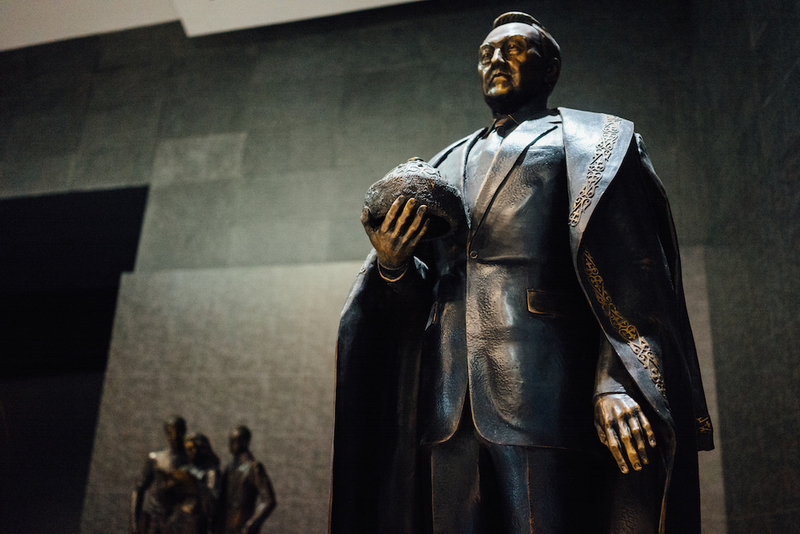 So, besides the biography of its President, what traditions, what histories survive in Astana? 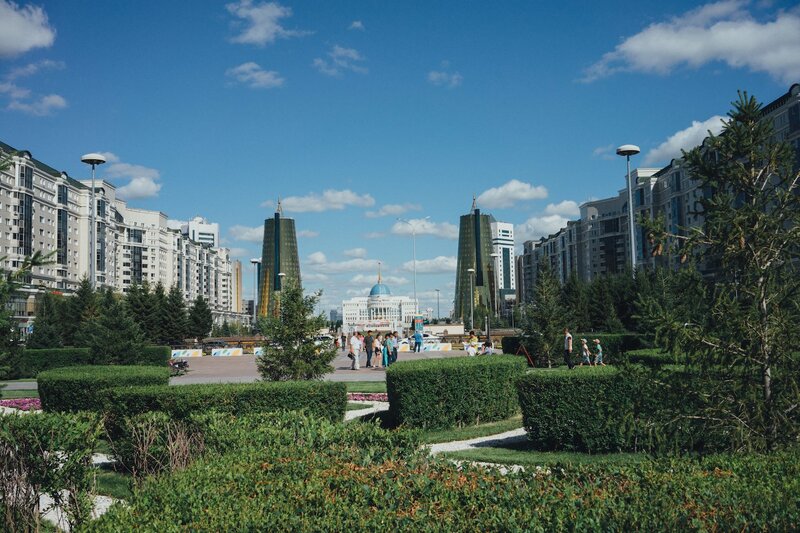 This nostalgia for the south illustrates a crucial aspect of Astana identity: it is a city without natives. The population has tripled to around a million since 1998, as economic migrants from southern Kazakhstan – and its less oil-rich neighbours Uzbekistan and Kyrgyzstan – have made the most of the blistering construction rate. 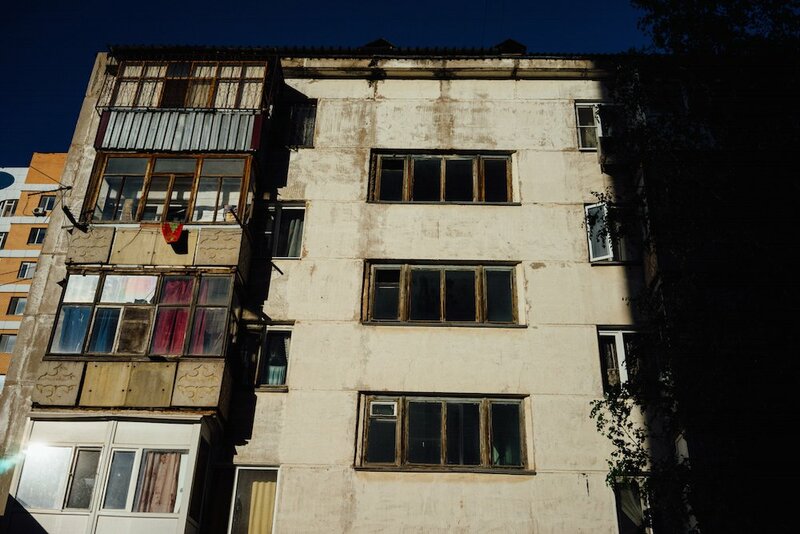 In a few years the first generation of post-Nazarbayev Astanites will come of age, but for now it’s a town of working men, often separated from their families, living patiently until the city becomes more homely. 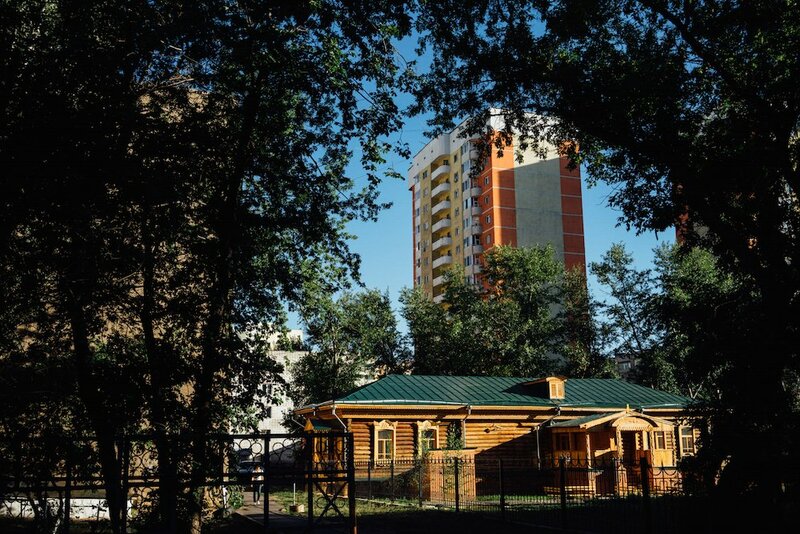 More than once I encounter a tautological bit of folkish wisdom, that “it’s better to live where it’s better.” Astana is clean and comfortable – it’s also lonely and expensive. Rents for the suburban new-builds eat up as much as three quarters of the average salary. The town is split roughly west to east by the Ishim River, the north and south quarters known as the “right” and “left bank” respectively. 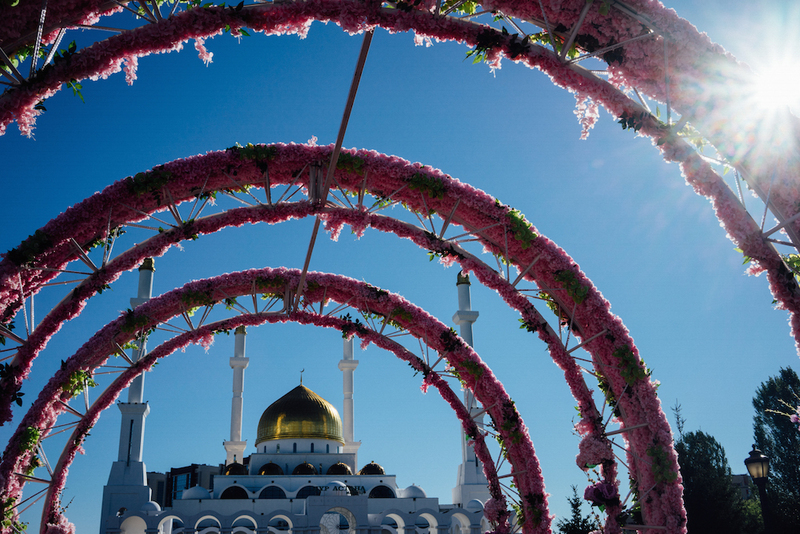 It’s the left bank that attracts the most attention nowadays – the commercial and governmental hub of contemporary Kazakhstan – and which most clearly demonstrates Astana’s war on tradition. Nurzhol Boulevard is at the heart of the city’s main axis, several kilometres of monumental pedestrianised gardens and highways housing its most obtuse statement architecture: from Foster’s Khan Shatyr shopping centre, a huge fluorine tent containing a rollercoaster and artificial beach, eastwards to Ak Orda, the presidential palace, an ersatz White House wearing a lurid blue-gold cap. The way is lined by a succession of entertaining extravagances – the rigid teal glass of the Emerald Towers, the pastel neo-Stalinist arch of the KazMunayGaz headquarters, the egg-shaped National Archive. I enjoy strolling down Nurzhol, which combines the high-rise mania of the Gulf city-states to which Astana is frequently compared with the symmetry and pageantry of the post-war Soviet parade. It strikes me as an update of Volgograd or Minsk, Stalinist triumphalism transmuted through oil money. Astana has a full array of totemic civic architecture – theatres, concert halls, libraries – but they all seem to belong in a city five times the size. There is nothing interstitial here, no cornershops or shady spots. 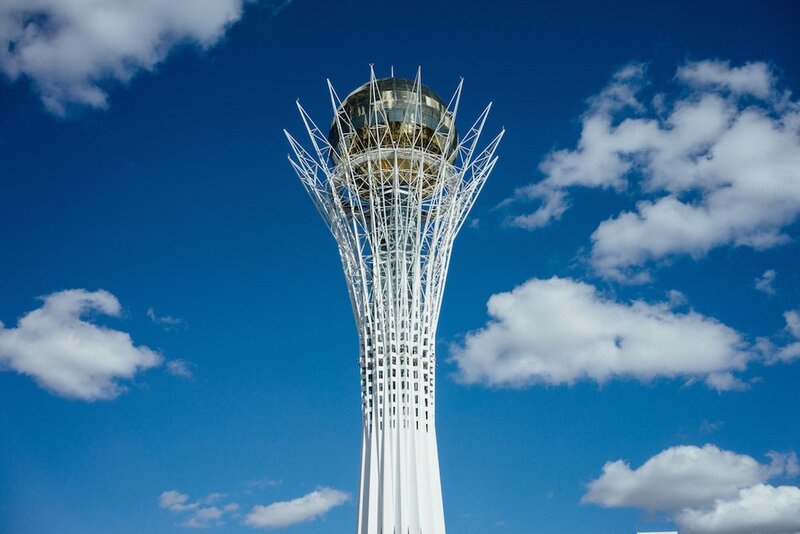 At the centre of it all is the Bayterek Tower: a 105-metre-tall column fenced in by white girders that flare out at the top to encompass a panelled golden sphere. Bayterek is the “world tree” of Kazakh mythology; the sphere represents the magical egg of the bird Samruk, said to contain all human happiness and wisdom, which is perched in the tree’s upper reaches, up in the heavens, way beyond the sight of man. More prosaically, this egg houses an observation platform. Looking out through the tinted windows onto the boulevard below, the city is a vision in sickly gold. The Nurzhol-axis is what most people are referring to when they talk about “Astana” — the incongruous glitz, the conspicuous petro-dollars — although perhaps the brand new glass-and-chrome complex built to house the Expo to the south-west will one day gain pre-eminence; it would be in keeping with the city’s modern hertitage for the centre to be rapidly displaced. Outside of this, though, it’s the right bank, that houses the modest Soviet town onto which this sci-fi weirdness has been grafted. This is what remains of the various Russian military and industrial settlements that have existed here since 1830. In 1961, the modest town of Akmolinsk was renamed Tselinograd, or “City of the Virgin Lands” – a reference to Khrushchev’s campaign to expand Soviet agriculture into the untended steppe. Walking through Tselinograd, I’m transported from Norman Foster’s playground into an unremarkable post-war Soviet town. Faded khrushchevki and Brezhnev-era houses clustered on tree-lined roads; a sense of quiet and inactivity; the maze of intra-block courtyards where mums push strollers and men fix cars. This could be pretty much anywhere in Russia, and it’s unusually soothing. There is a domestic scale and a lived-in greenness to the area, but it’s ringed in by modern towers, steadily being overtaken by a rapacious form of urban life. 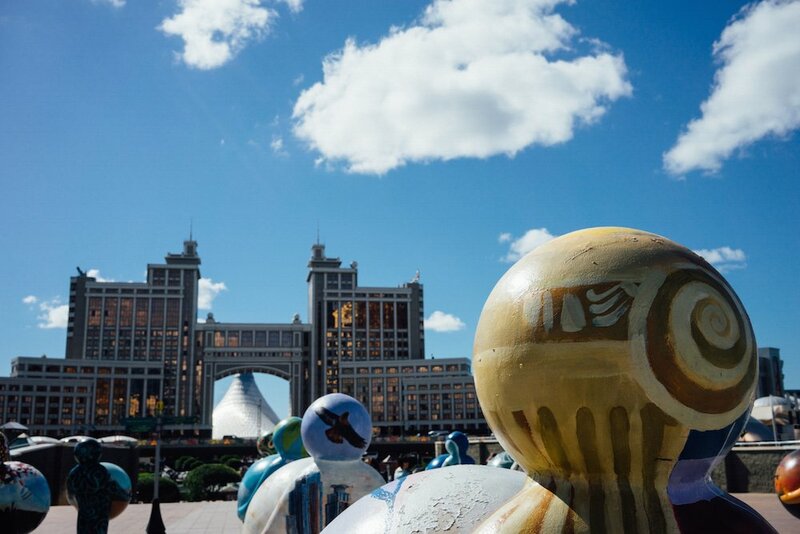 The other way to escape the central axis is to wander south-west, a walk that clears the head and gives a sense of how Astana actually functions as a steppe-city. Outside the skyscraper cocoon, the wind picks up immediately and doesn’t relent. Every six-lane road seems to stretch interminably, dustily on – until it stops abruptly. Dragonflies skim around your head. The buildings themselves are like life-sized computer renderings of themselves, lacking in detail or decoration, clad in reflective glass and gesturing unconvincingly towards various 20th-century styles; post-internet Stalinism meets reconstituted Blair-era residential kitsch. Every other building is half-finished and it is unclear which are occupied. The outskirts are also where the steppe comes into effect. One of the justifications given for moving the capital north was that mountain-bound Almaty offered little chance for expansion. The grassy nothingness surrounding Astana inverts this conundrum: this is a city that is expanding into a space it will never fill. Outside of the centre, Astana is dissolute, each block distant from the next. Without a car and with public transport painfully underdeveloped, this is unmanageable space – traipsing the long, empty pavements, time seems to seep away into these gaps between buildings. And at some point the construction stops and there’s nothing much at all. Despite my intentions, I’m struggling to separate Astana from its President. Nazarbayev’s fingerprints are all over town. Shatyr was his idea; the golden egg of the Bayterek monument was made to his specifications, and on its viewing platform you can press you palm against his handprint as you look out over his grand design. Very Ozymandian. In bronze statue form he is embedded into the base of the Kazakh Eli column that sits opposite the National Museum, in whose entrance hall he is represented by a regal portrait and in ornamental rug-form. He has his own Museum in the old town, that of the First President of Kazakhstan. 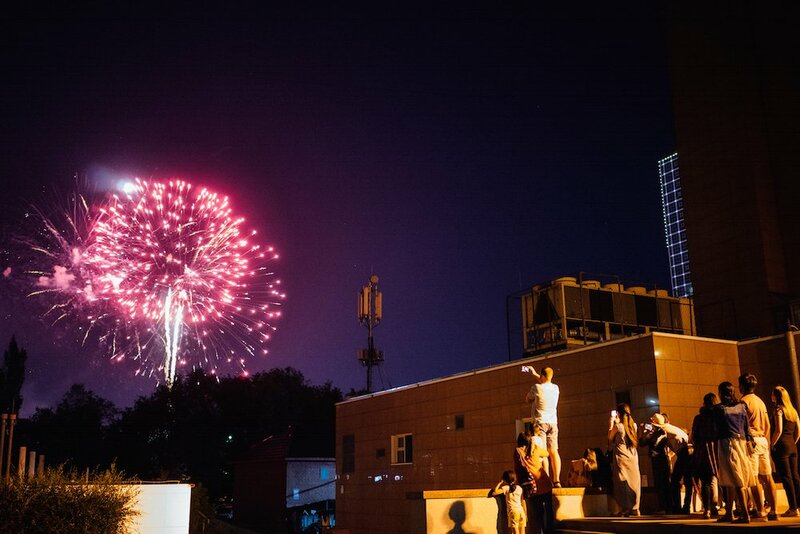 Come the night of 6 July, the smaller streets of the right bank are clogged with traffic and families weaving their way down to the riverbank to see some fireworks and mooch around one in of Astana’s few genuinely pleasant public spaces. On the cramped embankment huddles of teenagers joke and smoke, their faces lit up by the throbbing neon displays fixed to seemingly every available building front and bridge. Couples pose for photos. In the brief window afforded by the city’s/Nazarbayev’s self-coronation, something natural and public bubbles up. The next morning, in search of the town’s pre-history, I hire a taxi and drive west out of the city to visit the ALZHIR memorial complex, a modest museum dedicated to victims of political repression. ALZHIR (a nickname standing for “Akmolinsk Camp for the Wives of Traitors of the Motherland”) was a gulag reserved for the women and children of political prisoners held elsewhere. Often this meant the wives of the Soviet Union’s ethnic minorities, and records show that the camp represented a remarkable diaspora: Korean, English, Norwegian, Roma, Jewish. The architecture is striking – a truncated brick cone flanked by a chrome arch – the very site a reminder of a time when the steppe’s vast emptiness was put to different use. Outside, a papier mâché Soviet soldier wilts in the sun atop a reconstructed guard tower. Next door stands a billboard of Nazarbayev running his hands through the steppe grass. The museum makes a careful point of placing the gulag system at the end of a long history of Russian oppression of the Kazakhs, especially the pre-revolutionary suppression of the nationalist Alash Orda government and the revolt led by Amangeldy Imanov (now a Kazakh hero) in 1916. Few outsiders know that as much as half the population of what is now Kazakhstan – some 2.5 million people – died during collectivisation in the 1930s. My Kazakh driver, who’d accompanied me to see the museum for himself, nodded sagely. “Holodomor,” he said, referring to the much more widely-known famine that decimated Ukraine in the same period. There was indeed a radical intellectual tradition in Kazakhstan. 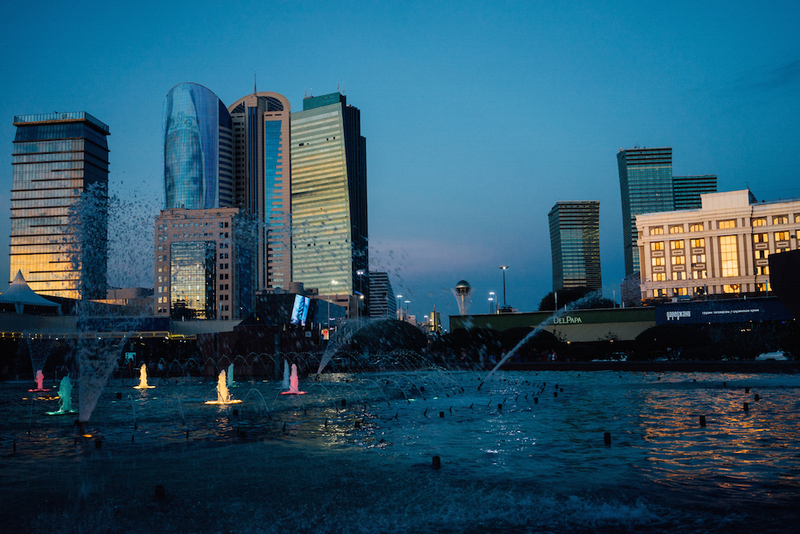 But Astana didn’t exist then, and the modern city is having its own effect on Kazakh culture. In the National Museum I meet Almaty-based artist Saule Suleimenova, whose new exhibition, Somewhere in the Great Steppe, has just opened in a small hall on the ground floor. 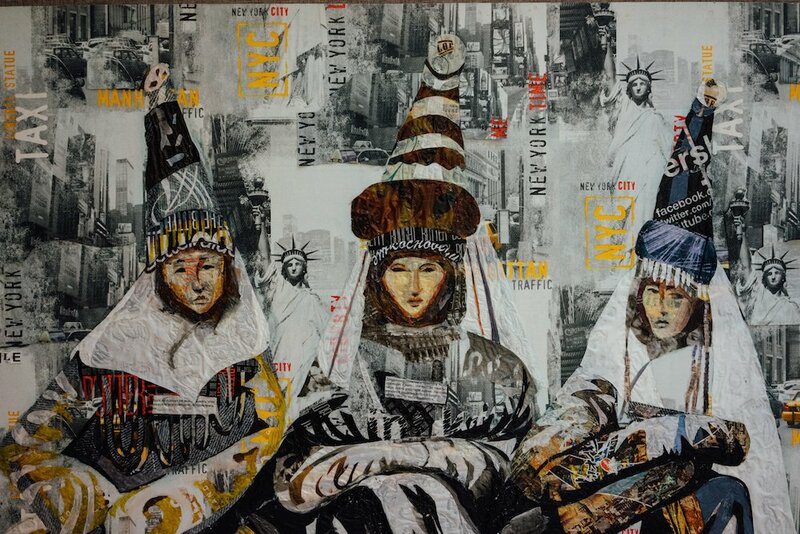 The floor of the exhibit is strewn with plastic bags, which alongside old magazines and other trash she uses to create images of Kazakh women in national dress and the landscape of the steppe. It’s a bold way of reconciling the modern and traditional, but not one that has gone down well with everyone. “I like the fact that [in Astana] you can see the horizon, feel the steppe, see the sunrise and the high sky,” she says. “But with the sky comes pressure from above. A vertical pressure. 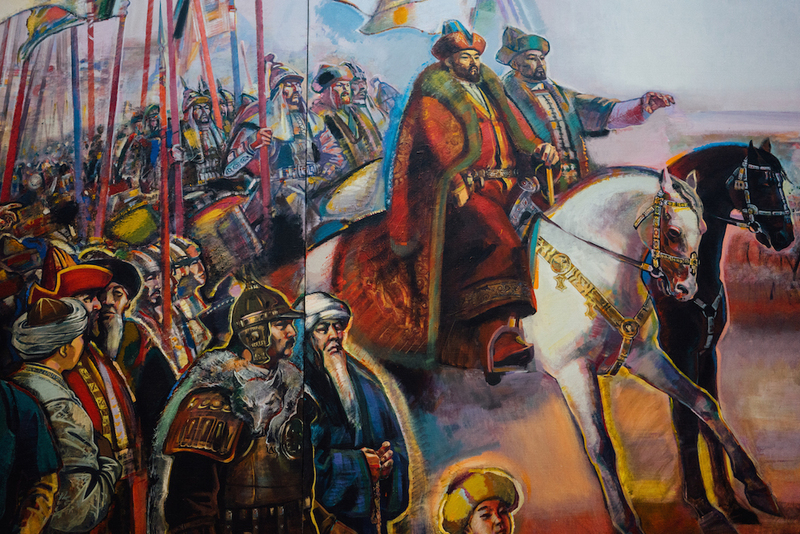 Nothing is done without pressure.” Suleimenova describes a constant turf war between contemporary artists in the capital and “authorities”: those with a vested interest in tacking to a growing “official art” movement that favours romantic, ethno-nationalist depictions of historical Kazakh heroes. All traditions are invented, but some are done so more conspicuously, on a grander scale than others. Astana has always been a tabula rasa: set in Virgin Lands, defined by the emptiness around it, even its name (“capital”) is a blank cheque to be cashed once Nazarbayev needs further veneration. Ties to the past are weakened and the future is forestalled because no one knows what comes after elbasy. That was the one thing that everyone I spoke to agreed on, regardless of their view of the regime. 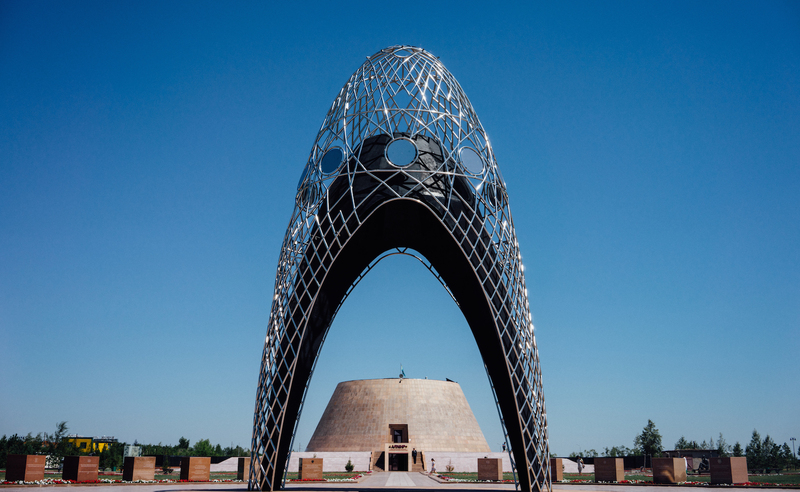 With his statement architecture and museum to himself, Nazarbayev has made Astana into a mausoleum even though he is still around and not planning on leaving. So the city goes on expanding, stuck in the present tense. 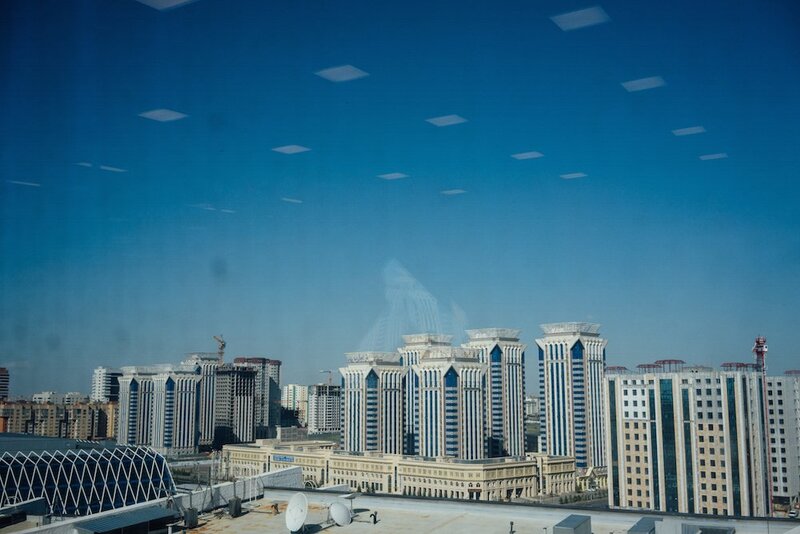 There are ways to view Astana that don’t rely on Nazarbayev, if you look for them. The architectural writer Owen Hatherley suggested to me after his own recent trip that the “syncretic” way of understanding Astana might be to approach it as a mishmash of historical theories on the ideal city: stately governmental architecture from Paris or Washington; Gulf-style modern mosques; Stalinist melodrama; fetishisation of the car imported from Los Angeles. This is a city which is visibly unfinished but whose billboards and hoardings are laden with projected images and renderings of its own future-perfect self. Until then, there are dragonflies and traffic jams, and fireworks on birthdays.